Anti-mining movement is gearing up in South Gujarat. The main slogan of the movement is, "Save river, save forest, save nature, save minerals and save our life". At the bank of Purana river in Kosambai village near Valod town in Tapi district, more than 10,000 peoples started an impressive agitation against rampant mining activities in Purna and Valmiki rivers. People gathered under the banner of the Adivasi Ekata Parishad. Mainly local tribals, they began an indefinite agitation on April 17, which converted into eight representatives of the Adivasi Ekta Parishad going on hunger strike, which began on April 22. Those who took part in the hunger strike were -- Lalsingh Gamit from Kosambia village; Namika Chaudhary, sarpanch of Mordevi village panchayat; Bhupendra Chaudhary, an Adivasi Ekata Parishad activist; several individuals from Kosambia village Jitendra Gamit, Rakesh Chaudhary, Gaman Gamit and Dinubhai Gamit; and Rakesh Gamit from Bahej village. It all began on April 17 morning, when people gathered at the statue of Dr BR Ambedakar and then began a rally, which ended at Purna river, shouting slogans against mining activities. People who took part in the rally felt that there has been adverse impact of mining on groundwater levels, which have gone down considerably. This apart, they complained, dust particles due to mining in nearby agricultural field is affecting their farming activities. Then, there are huge blasts in the river for carrying on mining activities, which are adversely affecting the check dams built on the two rivers. "More than 15,000 people have been affected by mining in five villages -- Mordevi, Kosambia, Bahej, Dolakiya and Kumbhia", a statement by the Adivasi Ekta Parishad said. A local delegation met to Union minister Tushar Chaudhary, who belongs to the adivasi belt of South Gujarat, with a list of their demands. 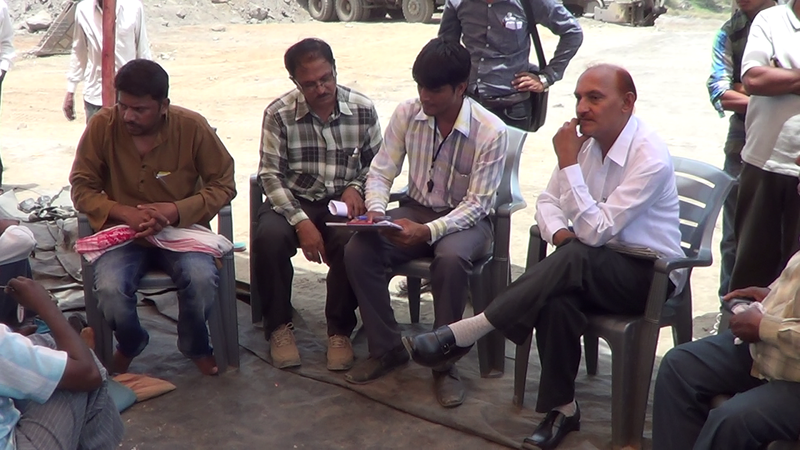 Then, on April 21 and 22, a five-member delegation met Tapi district collector Ranjithkumar and discussed the situation about illegal mining in the river stream. The district collector of Tapi took action and sent SDM and mamlatadar of Valod for site inspection and discussion with agitators and leaders. All the relevant documents along with a memorandum were presented to the collector and the officials at the dharna site. The demands included implementation of the Panchayat (Extension to Scheduled Areas) Act (or PESA), 1996, provisions relating to autonomous rights to tribals over natural resources at the place where they live. The Act specifically says that without the consent of the village panchayat, no mining activity can be undertaken. The district collector assured a detailed inquiry. The Adivasi Ekta Parishad statement said, "The agitation will spread in all the scheduled areas of Gujarat if we not receive any positive response from government authorities." A memorandum addressed to the Chief Minister, the state forests and environment minister, the industries and mines minister and the tribal affairs minister was also submitted to the mamlatdar. A copy was sent to the Governor of Gujarat, who is constitutionally duty bound to safeguard tribal people's rights. * A senior Gujarat-based activist with Setu, and an executive member of NGO Mines, Minerals and People.